Avenir Eclectia is the name of a colony in the constellation Cetus, the whale, and its star is called 94 Ceti, but the locals know it as the Whale Star. The colony consists of the Avenir, a generational spaceship turned orbital habitat, circling Eclectia, a barely-habitable planet subject to violent seismic forces. On the station are the dubiously rich, those who can afford to be away from danger, and the scientists who work to make new toys for them—called wizards by the population of beggar orphans because of the strange forces they use and their belief in the sea. On the planet are miners and hunters, and undersea there are cities of the middle class, built underwater for the greatest safety. The sea life includes sentient, telepathic beings some call angels or even honour as deities, but others rubbish the thought. Soon after settlement, some of the planetsiders began to construct the first underwater cities, since the ocean floors were less volcanic in many places than the land masses. Oceans cover nearly 40% of the planet's surface and are located at the planet's poles where it is coolest. Depths have been recorded at over 10 kilometers. However, due to the planet's volcanic core, depths of more than six kilometers are too hot for habitation by most lifeforms. Relationship to Ancient Earth is somewhat foggy as many files have been corrupted multiple times and often only hearsay is left. One remnant is the use of Days having 25 hours, which does not match the planet's cycle but can be recreated artificially on board the Avenir and also underwater to an extent. Months of 30 days are also used, though Eclectia has no moon, but the Approachings fulfill the same purpose. A 94 Ceti year has 454 days, made up of 15 Months plus the 4-day Festival of Founding. The months in order are: Celeste, Dax, Isadek, Terra, Alumnus, Railway, Cathar, Benzine, Illecof, Tower, Macbane, Lantana, Aquarium, Pimpernel and Turnpike. The names originate partly from the Founders' own names and partly from Earth terminology fallen into disuse in this new world. The colony is completely isolated from Earth or any human contact, and the only interaction is between the Avenir, the settlements on Eclectia, and the mining operations on Sheba. 94 Ceti is a binary star. Eclectia orbits the primary star at a distance of one astronomical unit. The secondary star orbits the primary at a distance of 150 AUs on average and appears consistently as bright as Earth's moon, when seen from Eclectia. The secondary star is called the Twin Whale or just the Twin. The Avenir's orbit around Eclectia is extremely elliptical, so that it is quite far away from the planet most of the time, but with regular close approaches. This is so that the scientists aboard can carry out surveys of the volcanic surface from above. It is at these times that they also attempt to communicate with the ocean life, so that these periods have taken on almost a religious significance. The entire orbit takes sixty days with one Approaching every month. On the Avenir, the brisk trade in luxury goods, such as are available from the small trading ships, has birthed a healthy black market in its wake. Ships in various states of disrepair regularly connect the planet and the station, but not all the traders are honest. Of course there are those on the Avenir who receive unregulated goods, and are not above stealing more to go with them. This 'criminal element' is also largely responsible for the gangs of raggedy children who congregate in some of the seedier open spaces around Avenir - these who refuse schooling and instead prefer to listen to the ramblings of their "wizards", the eccentric scientists. The skies above Eclectia are dominated by the remains of a recently-disintegrated small satellite, with lava glow clearly visible from what was once its core. Its name is Sheba, and it is mined for mineral ore. The smaller remnant is Quatermain. There are also a large number of fragments, which the cowboys herd to be smelted. The weather is dry and windy, with volcanic ash in the air at all times. Land-dwellers are also known as grit-breathers. Ash lung is a terminal condition that results from this, though it is not predictable: it has even been known to strike children and leave old men alone, though that is the exception. Eclectia is not stable on its axis, and wobbles on a five-day cycle, meaning that one end of the cycle will be very hot and the other very cold, and every second cycle the winter period falls at night which makes it even colder. Likewise every other cycle the summer period falls in the daytime, making it even hotter. For the people of Eclectia, winter and summer are just a few days each, in an endless repeat. There is a general shortage of people to make up the required workforce for basic operational needs. Many people work at least two jobs during their best years, retiring from one of them on reaching an appropriate age. Peacekeepers work as plain clothes investigators and command uniformed enforcers. On Avenir and in other large population centers, the Investigating Peacekeeper is in charge of all facets of an investigation including oversight of assisting peacekeepers and enforcers, preparing cases against suspects, and seeing to the carrying out of sentences involving capital punishment. In the field, a peacekeeper travels a circuit of his assigned area and dispatches enforcers to keep order, investigate crimes, and apprehend suspects. The peacekeeper is then responsible for empanelling a three person tribunal, prosecuting the accused, and insuring that the accused receives a proper defense. The accused has the right to appeal the verdict to the Council on Avenir. The best analog of this role of the peacekeeper would be the Texas Rangers of 19th century North America (Both during the Texas Republic period and after statehood). Peacekeepers and enforcers are answerable to the Council. Trinity University is located in the underwater habitat of Christchurch and is a multi-discipline Catholic institute of higher learning. Its admissions are open all and welcomes exchanges of instructors from other institutions. The two schools are Sciences and Arts. The School of Sciences is composed of the Departments of Applied Sciences (Engineering being a standout), Physics (which, with the Jesuits, operates the observatories on Assisi), Materials (in which Alchemy is of note), Biology (known widely for it work in Gnomenclature), Magic (reputed to have one of the best Conjurment courses of any School of Science), and Medicine (operator of Holy Family Medical Center). The School of Arts is composed of the Departments of Cosmo-Geohistory (of note for its Xenoarchaeology and Museum), Literature (home of the Fabian/Bridges/Reinhard Competitions), Applied Arts (which hosts the Norman Rockwell Institute of Fine Arts), Languages (with its esteemed Rivera School), Music (sponsor of the Annual Composers’ Tag-Team Matches), and Psychosociology (with its Bedlam Clinic and Outreach). The Abbeys of Francis and Jerome. The Abbey of Francis belongs to the Franciscan Third Order Regular and is located on Assisi, an asteroid orbiting at an angle of 78.654 degrees to the plane of the ecliptic. The abbey houses a seminary and provides quarters for the staff and researchers of the St. Joseph Cupertino and Consolmagno observatories. The Abbey of Jerome belongs to the Franciscan Order of Friars Minor and is located underground in an abandoned platinum mine on Sheba. It specializes in the education of Bibles who are paired with the priests from the Abbey of Francis. Long haul shipping is predominantly of three types: reaction, lightsail, and ballistic. Reaction propelled ships use fusion powered elements that create a plasma when a reaction mass is introduced. The resulting plasma is directed aft through either a venturi or an orifice plate and produces drive. At the moment, there is great dispute among Power Engineers over the cost-effectiveness of the two designs. The argument boils down to the lesser efficiency of the less expensive orifice plate system versus the higher efficiency of the more expensive venturi system. Whichever is used, the norm is for the ship to boost to speed to enter the most economical orbit to reach their destination. The engine is then shut off and the ship coasts to a point at which it then is rotated 180 degrees. It restarts its engine and brakes until it arrives at the destination. Ships of this type are normally designed to stay in planetary orbit while lighters transport passengers and cargo to and from the spaceport. Lightsails, or sunjammers, rely on the primary’s solar wind to move them outward and its gravity to draw them inward. This is an extremely inexpensive method of spaceflight but comes at a cost; it is also extremely slow. Not only is the solar wind slow to accelerate the lightsail, but the originating port and destination have to be in the proper alignment (this is why navigators aboard lightsails are tweaked as “astrologers”). Ballistic carriers, known as “cannon balls,” are not accelerated by their reaction engines but are, instead, launched by mass drivers. The reaction engines are not started until time for braking at the other end. 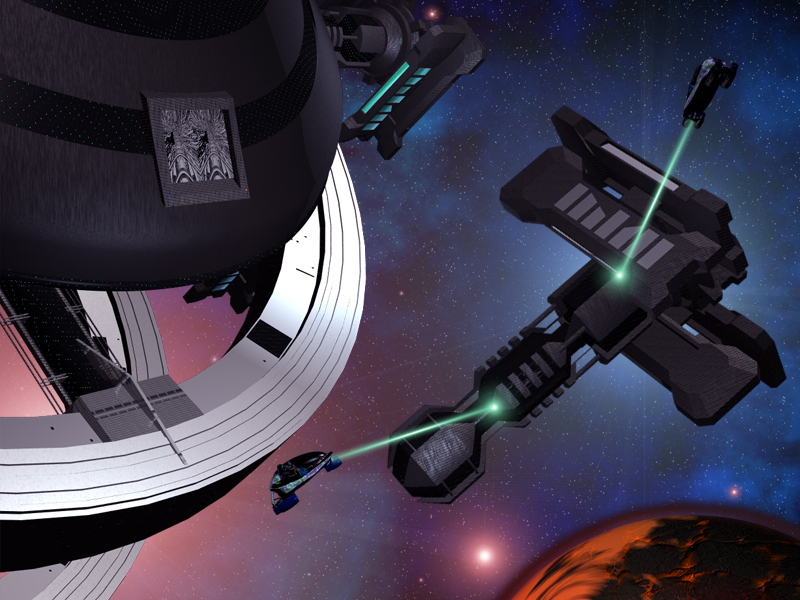 The ship is accelerated by a system of electro-magnets at the originating port and, thus, must be smaller than either a reaction drive ship or a sunjammer. Because of this, cannon balls usually are used to transport small, high value cargoes. The ore movers known as “cowboys” are a subculture of their own. Taking many of their traditions from the Westerns-folklore-based entertainment genera, it is probably natural that they would adopt the parlance of the cattle drover as they herd ore bodies to the smelters. To do this, they use their small, powerfully engined ships called “cutting horses” to enclose the ore bodies in a net of tractor fields. The mark of a cowboy is the wearing of his or her environment suit at all times when away from the “ranch” (their home base) or the “cow town” (the smelter). While some consider this to be an affectation, according to cowboy sources this habit grew up because a cutting horse might be holed at any time on a drive. That the occupation is a dangerous one is borne out by the high incidence of death while engaged in their work. This has led to the saying among cowboy families that “a cowboy lives fast, dies young, and leaves a handsome corpse.” This mindset leads to cowboys partying hard when celebrating births, wedding, and deaths. One cowboy, when asked why he didn’t cry at his mother’s funeral, replied that he figured there’d be pretty time for that if she wasn’t there when he got to Heaven. One of the striking things about Eclectia is the extremely high speed of its axial precession. 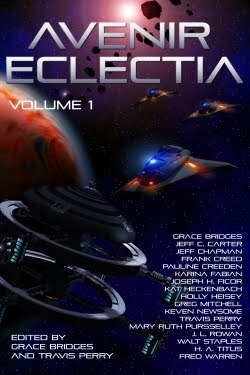 While all known planets’ axes wobble around slowly describing a circle, the ends of Eclectia’s circle so fast as to seem to be attempting to orbit in their own right. The causes of this are Eclectia’s twin satellites, Sheba and Quatermain. At one time, the two bodies composed a single smaller planet that the colonists refer to as Sheba. It’s postulated that when Sheba was captured by Eclectia’s gravitational field, the planet was torn apart becoming the pair of present satellites and a huge number of fragments. Judging from the still hot cores of the two major bodies and the fact that so many fragments have not been pulled in by the planet and its two satellites, the destruction must have been very recent. 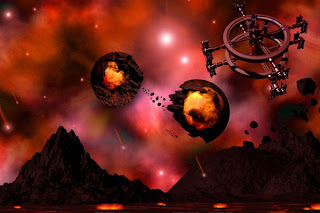 A second reason that the pieces have not coalesced has to do with the interaction of the five gravity fields (94 Ceti, Twin Whale, Eclectia, Sheba, and Quatermain) that war with each other. Finally, there is the problem that Sheba and Quatermain, while generally on the same side of Eclectia at any one time, are in orbits that find them approximately 23 degrees from each other. That the plane of their orbit is tipped 41 degrees to Eclectia’s equator induces the wobble in the parent’s axis of rotation. Neither satellite retains an atmosphere and the thinking is that if the united Sheba had one to begin with, it must have been quite tenuous. Sheba: Cadmium, Gold, Iridium, Molybdenum, Lead, Palladium, Platinum, Silver, Tantalum, Tungsten, Uranium. Quatermain: Aluminum, Beryllium, Chromium, Cobalt, Copper, Germanium, Iron, Lithium, Magnesium, Manganese, Nickel, Tin, Titanium, Zinc, Zirconium. Ore bodies among the remaining fragments are “herded” by the cowboys and delivered for smelting.